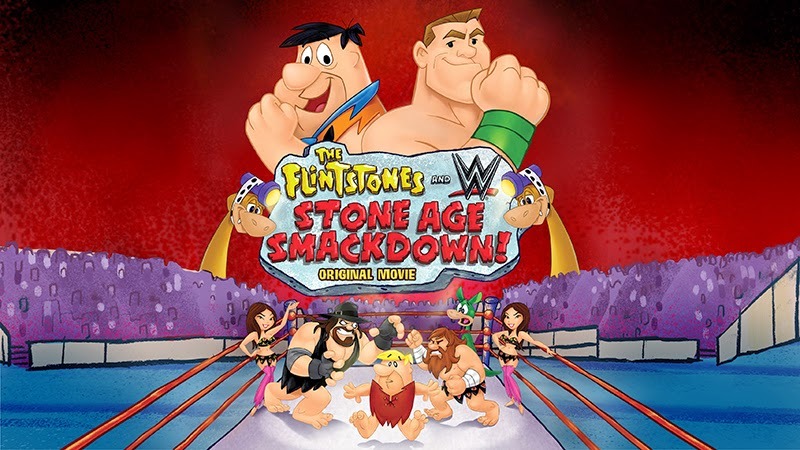 Fred, Barney, and the whole Flinstones gang wants YOU to join them in an epic WWE #Smackdown! ***When Fred loses his family's vacation money, he hatches one of his hair brained plans to get it back. It's a sports entertainment spectacle that involves throwing his best bud, Barney into the wrestling ring with the likes of John Cenastone (John Cena), Rey Mysteriopal (Rey Mysterio) and even The Undertaker, with Fred himself as event promoter! The crowds roar, the "clams" are pouring in from ticket sales and even Mr. McMagma (Vince McMahon) is taking notice of all the hoopla. Including all-star appearances from The Boulder Twins (Brie and Nikki Bella) Marble Henry (Mark Henry) and Daniel Bry-Rock (Daniel Bryan), it's time to get the whole family together for hard-hitting, side-splitting laughs from the most epic event in all of prehistory! • Take the quiz to find out which Flintstones and WWE Stone Age Smackdown Star YOU are? • Watch the official trailer and click the box art to bring the film home today! Have your kids colour, then cut out the paper dolls above for a fun family activity! Personally, I'd go with Barney, I've always had a crush on him! You can win the #FlintstonesWWE Blu-Ray + DVD + Digital HD Combo pack for your family! Just follow the instructions below! Open to USA, 18+, No PO Boxes. Giveaway ends on 3/26/15. I have received no compensation for this post. All opinions expressed herein are my own. my alter ego is john cenastone! I'm John Cenastone! kristiedonelson(at)gmail(dot)com Thank you! Barney Rubble is my alter ego. The flintstones are the best! Defintely grow up on them and absolutely love this! thanks for sharing! I am John Cenastone also. My alter ego is John Cenastone. I'm not able to pin the giveaway because there isn't a picture on it. John Cenastone is my alter-ego. I was the alter ego the Undertaker when I took the quiz. I tweeted my Smackdown alter-ego name on Twitter at https://twitter.com/likwan/status/581438685733732352.